Trees have never constituted a major part of the landscape of Abu Dhabi Island. At present odd acacias and palms dot certain areas, such as Khalidiya, and the occasional Indian Almonds predate the recent rash of exotic tree plantings on traffic roundabouts and roadside verges. Very few of Abu Dhabi's Zizyphus spinachristi ("Sidr") were originally wild on the island, (though it is a Gulf species) as testified by their very small spine size. However, there is one species of tree, which is relatively abundant, and that is the mangrove. Actually, mangrove is really a descriptive term, as the word covers a whole catalogue of various trees, bushes and shrubs. Around Abu Dhabi mangroves can be observed on the east side of the Island between the end of the Defense Area and the northern end of the Airport runway. Here is a low-lying, marshy region, extending in a series of channels, mudflats and lagoons for up to 1.5 km from the mainland proper. Various grass spp., rushes and shrubs have also adopted this habitat, thus creating an ideal wetland for migrant birds. The mangroves stand out singly or in small groups, and individuals reach a height of four meters locally. Mangroves can also be reached on the inland side of Sadiyat Island, and at various places up and down the coast from Abu Dhabi, particularly on the mainland side of islands just offshore, such as Abu al Abyad. 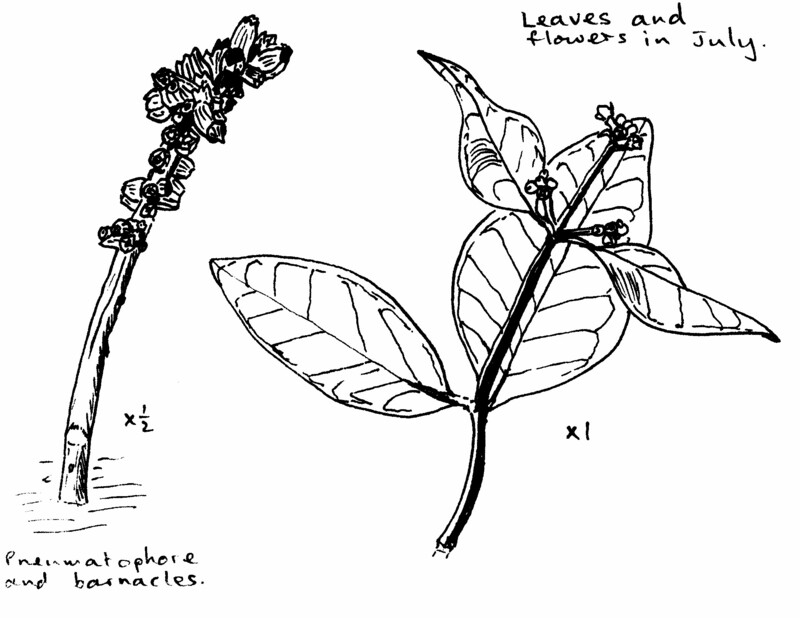 The local species is Avicennia marina, or black mangrove. The more widely known red mangrove, Rhizophora apiculata, with its trunk on stilt legs above water level, is not represented in Abu Dhabi. The black mangrove seems to survive quite well in the local mudflat habitat, exposed at low tide but often with the lower leaves covered at high tide. Wave action is extremely limited, if not non-existent, because of the mat of vegetation. Mangroves require still water, which accounts for the fact that they are never to be found on exposed coasts, such as the northeast side of Abu Dhabi Island. All mangroves possess the ability both to withstand the rotting effect of permanent immersion in water logged mud and to resist drought conditions. The salinity of the water off the east coast of Abu Dhabi Island is higher than the sap of the mangrove can tolerate. The tree adapts by developing pneumatophores, thin vertical tubers that branch off the widely spread underground root system. These tubers stick up a few inches above the mud and are usually covered at high tide. These projections are covered with large pores that act as "snorkels" for the tree at low tide. A single tree in the Abu Dhabi habitat may have as many of 200 pneumatophores around it, but in some parts of the world this figure rises into the thousands. Avicennia marina, in fact, prefers sandy rather than mud environment, which may account for the fact that it does not form a thick forest naturally. On the other hand, this species can tolerate much saltier conditions than the red mangrove. It can rid itself of excess salt through glands on the upper surfaces of the leaves. If you go out to a mangrove tree, you will be able to see the dirty salty surface and feel the greasy leathery condition of the upper sides of the leaves, while the undersides are noticeably clean and bright. The flowers of Avicennia marina re an inconspicuous yellow, half buried within the leaves. Locally the peak month for flowering is June, and the season is virtually finished by the end of July. 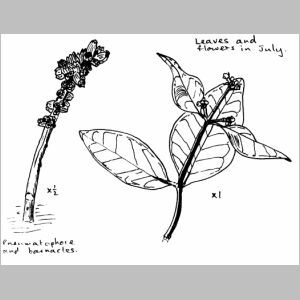 As in all mangrove spp., the seeds germinate on the parent plant and drop off as little balls up to 2 cm in diameter in November and December. Provided conditions are right, these seeds very quickly extend roots and establish themselves, not necessarily beneath the parent tree, as daily tides carry the majority elsewhere. Along the east side of Abu Dhabi Island, there seems to be a high wastage rate, as thousands of these seeds are washed too far inland on winter tides and dry out and die before becoming established. 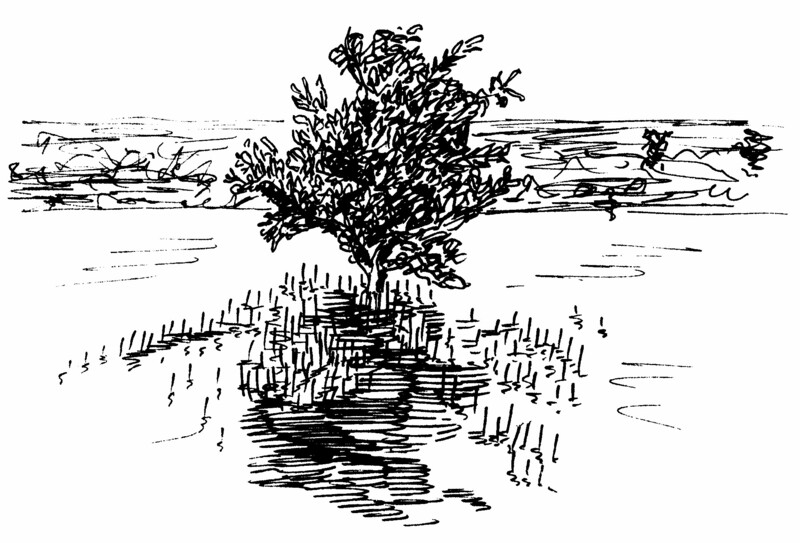 One may speculate that mangroves originally entered the Gulf as seeds borne on ocean currents. The pneumatophores of the local mangroves are colonized by barnacles, which also cluster on the lower leaves and twigs. The barnacles also grown on top of each other so that the pneumatophores sometimes resemble unwieldy clubs, dull gray and brown in color. 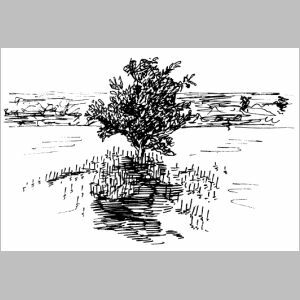 It has been suggested that the mangroves along the UAE coastline have been over exploited by man in the past. While this might have been the case in one or two areas, it is a doubtful hypothesis. The timber of Avicennia marina is quite useless, unlike that of Rhizophora apiculata, which can be used for firewood and for making charcoal. A more likely explanation for the general scarcity of the black mangrove is the extremely high salinity of the Gulf littoral, and the muddy rather than sandy environment in sheltered areas where the species has been able to establish itself.